SAFETY NOTE: Be sure to wash your hands thoroughly while handling raw poultry and make sure there is no food other than the ingredients you need on your work surface. Setting up a mise en place prior to start is always a good idea. Nothing ruins a good evening like a salmonella. Prep your vegetables, salt/pepper to taste. Wash your bird under cold water. Be sure to rinse out the cavity well, remove any left over organ bits. Pat dry thoroughly with paper towels. Some chickens will have fat deposits around the cavity opening near the tail, you can cut them off for a heart healthier chicken (they look like cream colored pillows). If roasting in the oven: Put the vegetables in the bottom of the roasting pan. Rub the entire chicken with herb rub, use a good amount and massage it into the skin so it sticks rather falling off all over the place. Don't forget the areas under the wings and between the legs. Stuff the cavity with crushed garlic cloves, fresh herbs, and fruit. Pack really tight. Place the bird on top of the vegetables. Tuck in the wings, otherwise they will burn. Fill the pan about 1/2'' with liquid of choice (I use a mix of chicken stock and water, or white wine and water). 350ºF on convection, about 1-1.5 hours until the juices run clear when pocked with a knife and the internal breast and leg temperature is 180ºF. Baste often with liquid from the pan. Flip the bird half way through for even cooking and color. Flip back again for final skin browning. Once out of the oven, cover with foil and let rest for 30 minutes. Carve and serve with the vegetables that cooked with the chicken, a side green salad, and a glass of white wine. 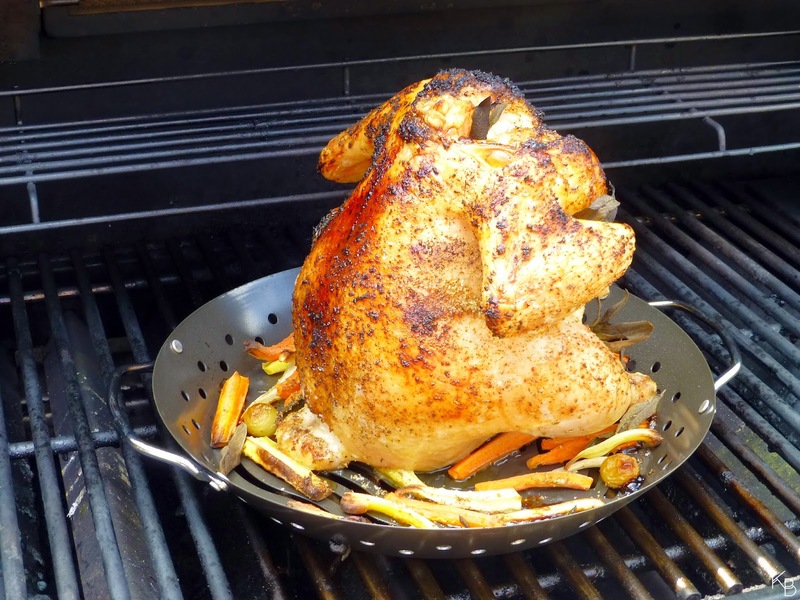 If roasting standing upright on a grill: Check first if the chicken will fit into your grill with the lid closed! Preheat the grill. Either use a vertical chicken roaster or an aluminum can* (cut the top off the can so you can stuff it). Fill the can/roaster stand with beer or wine and lots of fresh herbs. Slide on the the chicken very carefully. Tuck in the wings, chicken will look like it's having an attitude problem. Massage in the rub, start from top and work toward the bottom. Press in hard, it tends to fall off immediately since you are rubbing a vertical surface. Tuck in fresh herbs under the wings. If you're using a roaster, surround the chicken with vegetables. Put the chicken very carefully in the middle of the grill, close the lid. Medium-high heat, about 1-1.5 hours depending on size of chicken, until the juices run clear when pocked with a knife and the internal breast and leg temperature is 180ºF. For even color, turn the chicken around once in a while so it cooks evenly on all sides. No basting needed, the liquid inside the can/stand boils and steams the chicken with flavor and moisture from inside out. Once cooked, very carefully transfer to a cookie sheet for transport back into the kitchen, cover the whole bird with foil and let rest for 30 minutes. Before serving, very carefully lift off the can/stand. Serve with either a Greek salad or my Salad Olivier and either cold beer or wine. *If using the can, stray the can with cooking spray otherwise the chicken will stick and will not lift off easily. Cornish hens: This recipe can be applied to Cornish hens as well. If I feel like poultry for a dinner party, I serve Cornish hens instead of a chicken. Choose small hens, so each person gets a whole one. Cook them all together in a large roasting pan, skipping the vegetables (there will be no room). Present them on a huge beautiful platter garnished with fresh herbs. Eating with your hands is allowed (but be a good host and have moist towelettes ready for your guests). If chicken refuses to brown to the shade you prefer: Mist the chicken with olive oil in the final 10 minutes of cooking. It will crisp and brown the skin. You can also vertically roast is in the oven as well, just remove all but one rack.